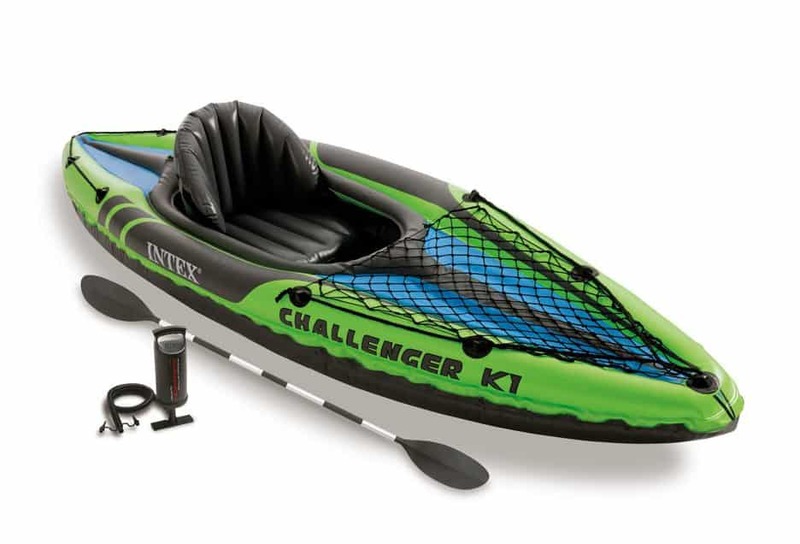 The Intex Challenger K1 is an affordable inflatable kayak crafted from durable PVC. Instantly recognizable by its distinctive safety graphics, this streamlined craft is great for use on calm waters and is roomy and comfortable enough for any kayaker. 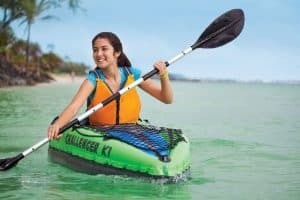 This kayak, priced at approx $80 and with dimensions 30’’x15’’x108’’, is meant for solo use and features an inflatable seat, floor and backrest. With a carrying capacity of 220 lbs. it can sustain the weight of even bulky individuals. The weight of the vessel itself is just 27.2 pounds making it easy to transport for anyone. Crafted from highly durable 22 gauge PVC – this has been confirmed by multiple consumers who have used it for dozens of trips without any problems. Even at its low cost, you won’t have to worry about buying another inflatable kayak anytime soon because of its reliable construction. Easy to transport – fits into a 2’ x 2’ bag which can easily be stored in the trunk of your car and the low weight means you can easily take it from the car to the water when you get there. Stability – the craft is perfectly stable on Class I and II waters and is also easy to leave and exit, making it ideal for beginners as well as kids. 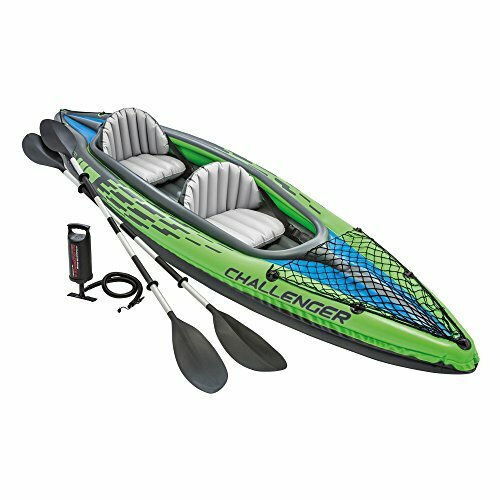 Very cheap – Priced at $80, you can easily invest in this kayak. This makes it perfectly suitable for those kayakers who are just starting out and don’t want to invest in a pricey vessel because they aren’t sure about kayaking entirely. Plenty of carrying capacity – the load carrying limit of 220 pounds makes it a completely dependable solo vessel (consider the intex challenger k2 kayak if you’d rather buy a tandem kayak). This has been confirmed by several kayakers. Additionally, several users over 6’ tall have reported that the vessel performs perfectly fine for them too. Repair kit included – in the unlikely event that your Intex does develop a leak, you can easily fix it without having to cancel your trip thanks to the repair kit and patch that comes with it. This is very thoughtful of the manufacturer, especially at the low price this product sells. Safe design – The cockpit is made from five separate air chambers which means that a leak in one won’t cause you to sink to the bottom. The sporty graphics ensure visibility in the water so you won’t suffer a collision with or get splashed by a larger craft. It is also approved by the RWTUV. The seams have a tendency to stick out; they aren’t flush around the craft’s rim. Their sharp edge may rub across your body as you paddle which can lead to slight discomfort. The lack of an adjustable paddle can cause trouble for people with smaller hands, and the manual hand pump can be tiring – you’d do better to buy a separate electric pump. However, the low price of the product makes up for these small reservations. The price of this vessel makes it perfect for the novice kayaker and coupled with its durability, reliability and mobility, you won’t find a kayak anywhere better than this one to match a tight budget. Perfect for those who are starting out in the sport or have kids / relatives for whom an extra kayak is required.